The Arcade Gaming System is unique to the Electronic Bingo market in that it provides the End User the ability to use commercially available computing devices as their electronic bingo handset or Player Terminal. The system can operate on devices such as tablets, smart phones and other mobile devices along with fixed-base devices. The system operates over a secure Wi-Fi network with all communications, Point of Sale operations, and game results being transferred wirelessly. The system can operate at one site or multiple sites that are linked together (where governing rules permit). All sales and game play are linked together in one common network. 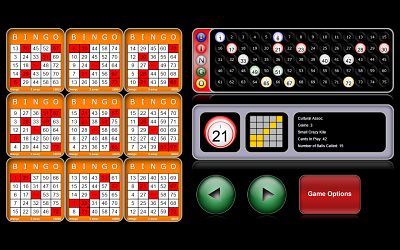 The system can be used anywhere a session-based game of bingo is played such as in a charitable, commercial, tribal, casino, cruise line or any social environment. You can select the type of mobile or fixed-based hardware you require for your site. Your hardware costs are then based upon your budget. The system is scalable and affordable. Perfect for small bingo halls that need a small number of devices for one session per week to large bingo halls that need many devices for many sessions per week. Modular Design - Additional functionality such as our Excalibur Calling Stand and MICROS Point of Sale (POS) can be added at anytime. 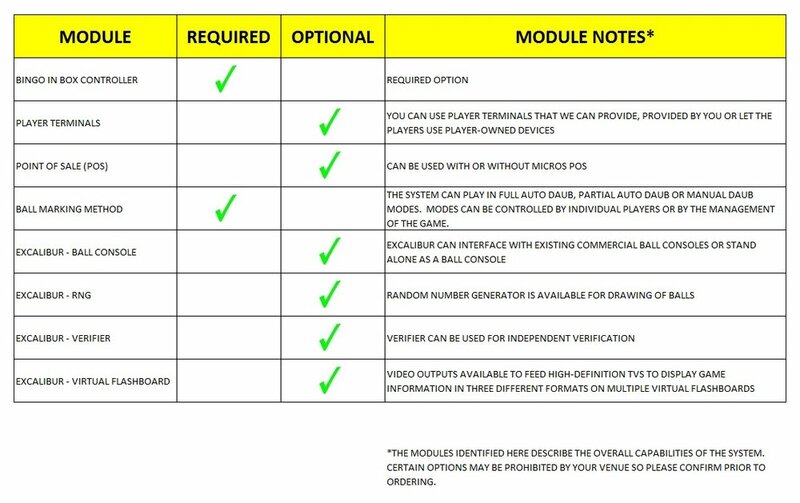 Can be used with just player terminals in its simplest setup. Simple setups can literally be prepared and shipped to the End User, ready to go, right out of the box - Bingo In A Box™. License the software as a service (SaaS) for those users who wish to directly acquire their own hardware in order to maximize their cost savings. Constant software cost per terminal regardless of the type of hardware being used. Licensing option is available to pay a one-time licensing fee for lifetime use by your organization. New hardware insures use of latest technology. No more concern on the level of technology being supplied. Simultaneously play Bingo on the same system used to play other services such as electronic pull tabs, Insured games, parimutuel-style games and social games such as solitaire.